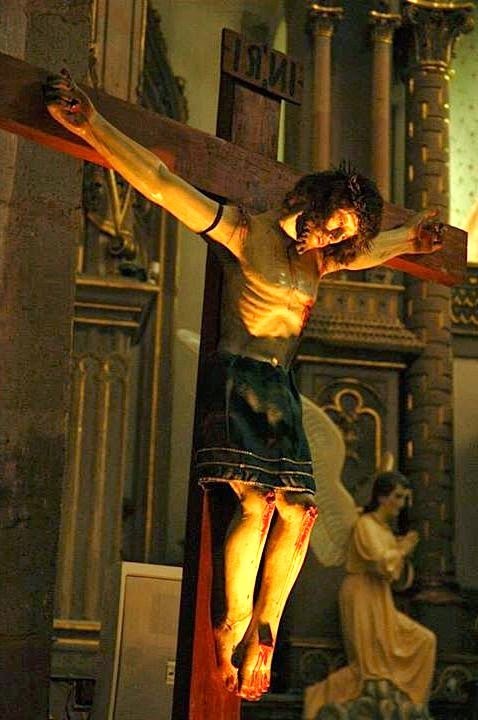 San Miguel Ixtla is best known for its annual Easter pilgrimage and celebration in honor of El Señor de Ojo Zarco (Our Lord of the Blue Eyes) a venerable cristo de caña, or lightweight crucifix, now lodged in the parish church. 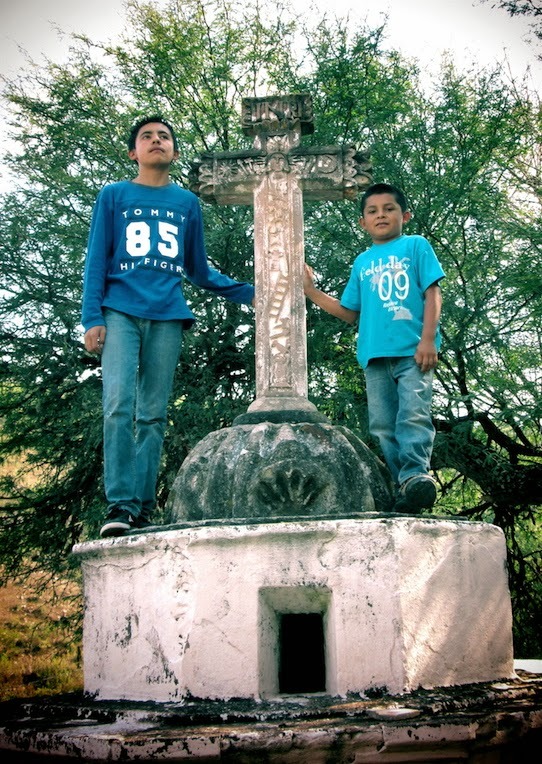 Originally the home of the eponymous crucifix, this is the largest of the Ixtla chapels. Also referred to as El Templo del Barrio, it is built on a raised platform of possible prehispanic origin. Approached by a flight of stone steps, the restored chapel boasts a rare, triple tiered tower and features an simple arched entry, decorated with foliar reliefs. 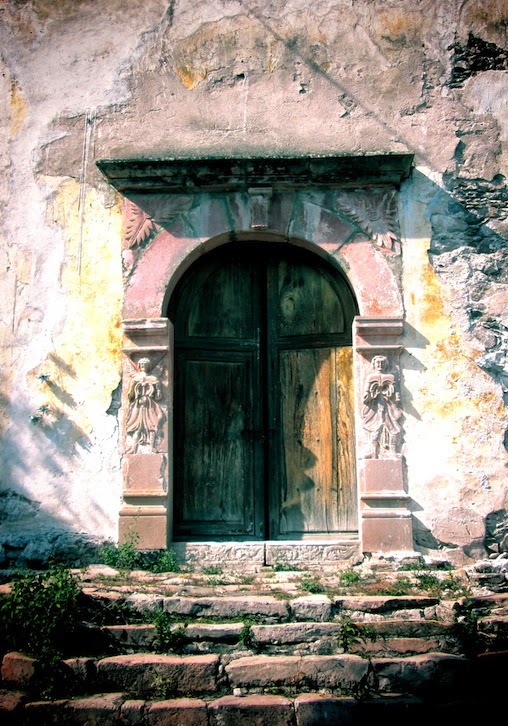 Archangels with sweet faces and flowing robes guard the doorway on either jamb. One unusual feature is the sculpted stone sill, a likely transplant, carved with angel heads and writhing relief foliage in early colonial style. 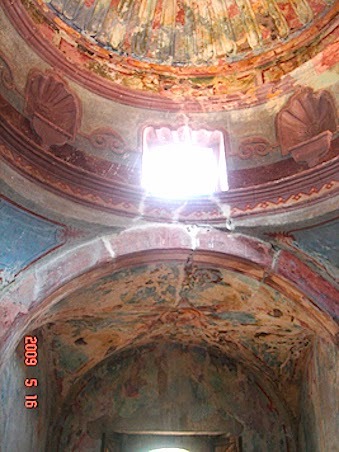 The spacious interior is covered with polychrome murals, although in very poor condition. These include the ample dome and drum with shell motifs and scrolled decoration. 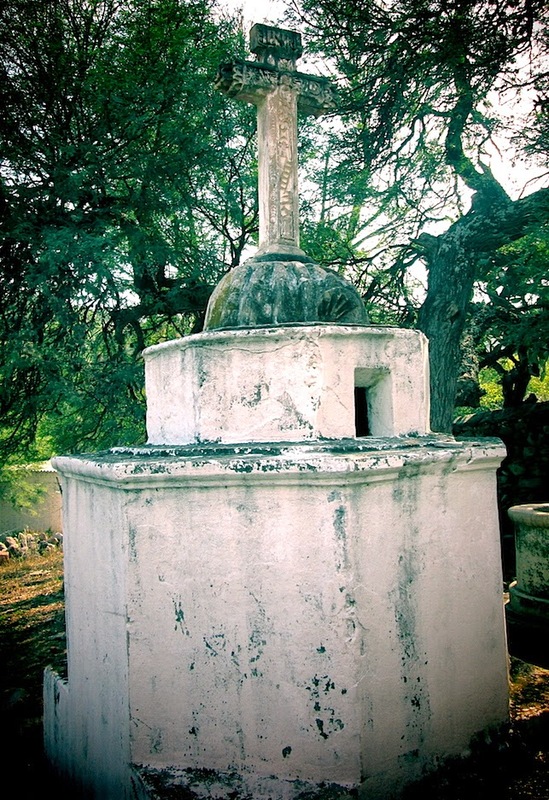 A special feature of the chapel is its handsome carved cross, facing the church atop a massive, two tier octagonal base. The cross springs from a domed, ribbed pedestal in the form of a squash or barrel cactus, as we saw at Nonoalco. 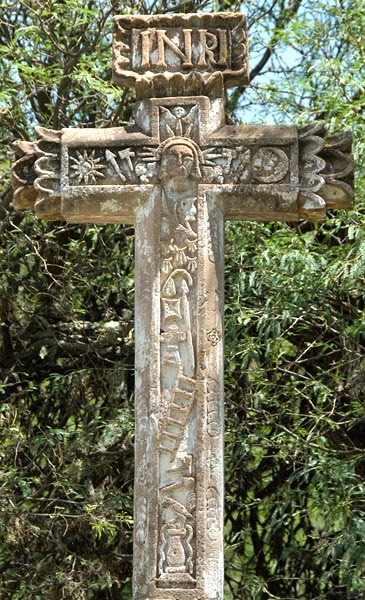 The cross-within-a-cross design frames numerous small Passion reliefs that include the face of Christ at the axis emitting rays of the Tres Potencias. Five miniature Wounds are crowded on the upper shaft, while the Sun and Moon appear on the arms. Several other Passion objects appear, including the Thirty Pieces of Silver in columns along the lateral facets. text © 2014 Richard D. Perry. images by Niccolò Brooker, Diana Roberts and others. Welcome to our blog on the arts of colonial Mexico. My practice is to highlight some special feature from the arts and architecture of colonial Mexico: sometimes a building, a sculptural relief, a statue, a painting or a mural, either individually, or in combination or comparison with other objects or monuments. In addition my focus is usually on less familiar works, and their special aspects. I hope to entertain and inform as I go, and usually offer some opinion or interpretation. I welcome constructive comment from my readers and fellow enthusiasts of colonial Mexico. So, stay with me. Please note: our new pages on Mexican murals are now posted on our sister blog, mexicosmurals.blogspot.com check it out.